As it turns out, the Main Street memorial—a marble shaft, rather than a statue—was ready first. 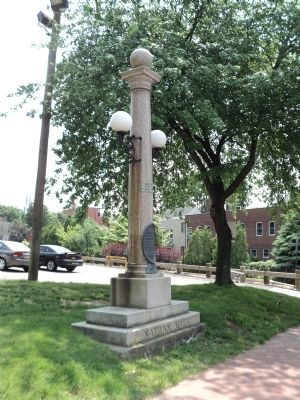 The shaft was erected in front of the library, which at that time was located in the Soldiers & Sailors Memorial Building, and was dedicated on July 4, 1894. The committee did not realize its goal of placing a Connecticut boulder on the shores of Huntington Bay. But the same year the Main Street memorial was dedicated, George Taylor, the president of a prominent Manhattan dry goods store, purchased a large tract of land in Huntington Bay. Taylor soon became enthralled with the Nathan Hale story—no doubt because he now owned the land where Hale landed. Taylor named his estate “Hale-Site,” a name that was soon applied to the entire section on the east side of Huntington Harbor. Taylor, at his own expense, also completed the second part of the memorial committee’s plan. He arranged for local contractor Oscar “Dynamite” Kissam to move a large boulder from near Taylor’s house to the beach. Perhaps unwittingly realizing the committee’s original intent, the boulder did, in fact, come from Connecticut, courtesy of the last glacier. Taylor also had three bronze plaques affixed to the boulder, telling Hale’s story. For three quarters of a century the boulder stood on the beach at the end of Vineyard Road, where, unfortunately, it was subject to the effects of erosion and vandalism. Ownership remained in the Taylor family. At one point Taylor’s grandson, Balmor Taylor, removed the bronze plaques for safekeeping. As early as 1962, he also explored transferring ownership to the Town of Huntington. It appeared that an agreement had been reached and in 1974, town workers removed the 45-ton boulder from the beach and transported it to a new home at the intersection of New York Avenue and Mill Dam Road. Mr. Taylor, however, did not think he and the Town had reached an agreement. Over the next two years, differences were resolved and an agreement was reached. The boulder was rededicated at its new location on September 19, 1976, two hundred years after Hale’s mission. But that was not the last stop for Huntington peripatetic monument. As part of the current road improvement project along New York Avenue, the New York Department of Transportation constructed a roundabout at the intersection where the boulder stood. The rock would be in one of the travel lanes around the new traffic circle. So last September (2012), the monument was moved once again. This time the move was only about 50 feet to the southwest corner of the intersection. When the roadwork is done, the area around the rock will be landscaped. The Town of Huntington continues to celebrate its most famous visitor. 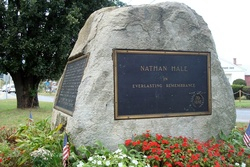 Just be careful when you read an earlier description that says the rock marks the spot where Nathan Hale landed. He did not land at Mill Dam Road.